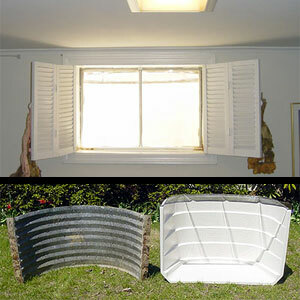 If your window wells are rusty, ugly, or open at the top, they can be dramatically improved. Window wells without covers let in leaves and debris, and rain and gutter overflow water gets in. The dirt bottom allows weeds to grow and mud to splash up onto your windows. All this makes for a pretty lousy view from inside the basement - the space you want to improve. 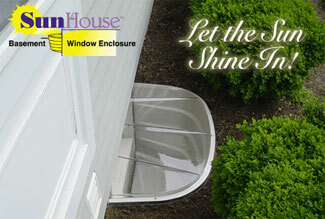 The light-colored SunHouse™ window well, features a sturdy, clear cover that fits nicely and a bottom that prevents weed growth as well as keeps leaves, debris, and rain out. One of the SunHouse™'s best benefits is that with the clean, light-colored bottom a lot more sunlight bounces into your basement and brightens up a space where we can use all the light we can get. WOW. Look at all the light that SunHouse™ reflects onto the ceiling. 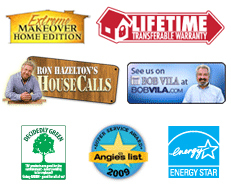 The SunHouse™ Basement Window Enclosure really dresses up what used to be an eye-sore. Bright and clean. Ask you local dealer about the benefits of a SunHouse™ basement window enclosure, before you have new windows installed!